What is Plus Network Redirect? Plus Network Redirect is a website you might find one day on all your browsers, including Internet Explorer, Mozilla Firefox, Google Chrome, and even Edge. It indicates that a browser hijacker has successfully entered the computer. Even though Plus Network Redirect does not look like a bad website, it is definitely not worth keeping it as homepage or a default search provider because it can cause much harm. Of course, you will also not be allowed to change the settings of browsers until you fully delete Plus Network Redirect. We hope you make a decision to uninstall Plus Network Redirect after reading this article. What does Plus Network Redirect do? 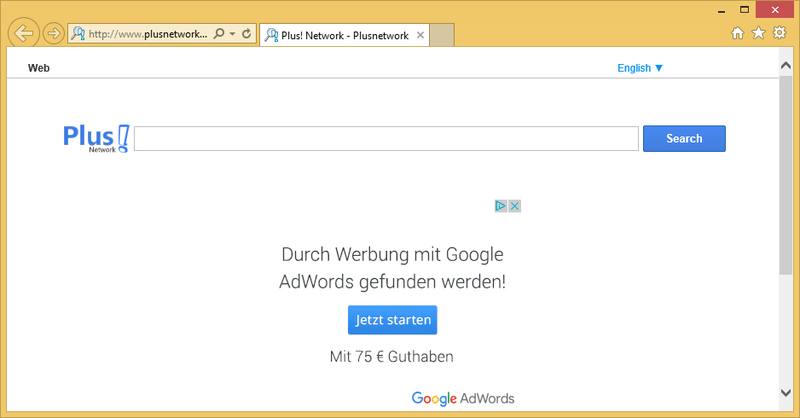 Plus Network Redirect is one of these websites that only pretend to be legitimate search tools so that they could stay longer on users’ browsers. Even though it seems that Plus Network Redirect provides accurate search results, the truth is that they are full of various commercial advertisements. Specialists were not surprised at all when they found this because it was immediately clear for them that Plus Network Redirect is used to generate the revenue for its author. Because of that, it shows ads and promotes third-party websites. Some of these websites might be just promoting products and services, but others might be more dangerous in a sense that they promote untrustworthy software. You might even find malicious software on these websites. It is impossible to say whether the link you click on will take you to a bad website or a good one, so it would be smart not to click on any of those advertisements. Unfortunately, not all of these ads can be recognized easily because they are made to look like ordinary search results. This also suggests that you could be safe only after the Plus Network Redirect removal. The last paragraph will focus on the Plus Network Redirect removal, so continue reading to find more. Why do I see my browsers’ settings changed? A browser hijacker infection is the one responsible for changes you see applied to all the browsers. These threats tend to appear on computers illegally. Just like a bunch of other computer infections, they are distributed by cyber criminals using the bundling method frequently. Of course, nobody can guarantee that you have downloaded a software bundle this time too because these infections might enter computers in different ways as well. You can protect your computer from the entrance of a bunch of different threats by installing a legitimate security application. How can I remove Plus Network Redirect? If you are not going to use Plus Network Redirect as your default search engine, you should remove Plus Network Redirect from your browsers as soon as possible because it will be of no use. Also, as you already know, it might cause harm to the computer very quickly. There are two ways to delete Plus Network Redirect from browsers. The first is, of course, the manual method and the second one is the automatic. If you want to get rid of this threat quicker, we suggest using an automatic scanner. Not all the scanners are trustworthy, so install a tool you know is worth trusting only.